However, there is a relevent accounting identity which is always true. The trade surplus is equal to net national savings….The implication of a large trade deficit is that either public savings must be very low or negative (i.e. a large budget deficit) and/or we must have very low private savings. There is no possible way around this accounting identity. This means that if the U.S. has a large trade deficit, as it currently does, then it must be the case that either households have very low saving or the country has a budget deficit. At the peak of the housing bubble, private saving was very low, since households spent based on their housing bubble wealth. Now that much of this bubble wealth has disappeared with the collapse of house prices, saving has moved back toward more normal levels. This means that to sustain the same level of output, the budget deficit must rise. There is no way around this identity. To say this slightly differently: with private saving at normal levels, if you want to reduce the budget deficit (as conservatives say they do) then you have to reduce the trade deficit. And how do you do that? The most obvious way is to engineer a weaker dollar, which makes exports cheaper and imports dearer. That means we sell more stuff to foreigners and buy less from them. But as a few minutes listening to Glenn Beck or any other conservative talker will convince you, conservatives are dead set against this. A weak dollar, they believe, is a sign of national decay. So then what? 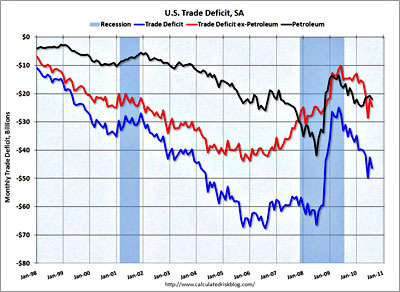 If you have to reduce the trade deficit in order to reduce the budget deficit, but you want the dollar to remain strong, what are your options? Well, an economic slowdown would do the trick, since that means we’d buy less stuff from overseas. That worked a treat during our most recent recession. But that’s pretty much it. In other words, as Dean says, if you want a lower budget deficit and you want to keep the dollar strong, “you must want  the level of output in the United States to fall and its unemployment rate to rise. That is the only plausible way that the accounting identities can be kept in balance.” Will somebody please tell John Boehner?